It's entirely possible an allied patrol of locals will roll up in a machine gun-mounted Humvee as you approach an enemy encampment. You might pause as they open fire on the goons you'd intended to kill. Then, just as you think it safe to proceed, two angry tigers might just randomly erupt from the jungle and maul everyone in sight. And when panicked pirates fell the beasts with a barrage of molotov cocktails, consequently setting the camp ablaze in a glorious display of conflagration, you'll marvel at the spontaneity of the events that unraveled before your eyes. This, in essence, is Far Cry 3. Ubisoft's series of open world first-person shooters has always been at its best when stories arise organically from the chaos. While stranded on a tropical island inhabited by murderous pirates and equally murderous animals, you'll experience things that no one else will ever see. You might choose to hang glide off a cliff right into an enemy compound. You might go hunting to craft better equipment. You might complete challenge missions for experience points so you can turn Jason into a more efficient killing machine. Most importantly, you'll never feel too lost or overwhelmed thanks to an intriguing plot that, while sometimes nonsensical and goofy, succeeds in lending a bit of cohesiveness to a series that traditionally hands players a gun, plops them in a hostile setting, and pushes them out the door with a "good luck" shove. Far Cry 3 still leaves you to your own devices for the most part, but you'll have a sense of purpose this time around. Gone are Far Cry 2's generic mercenary heroes and their ambiguous quest, replaced by a cast of rich kids that find themselves captured and sold into slavery by pirates after a skydiving trip gone wrong. To describe these spoiled Jersey Shore doppelgangers as unrelatable and annoying is a massive understatement, and their cringe-worthy personalities would be a bigger detriment to the game if not for the fact that encounters with them are few and far between. But they still serve an important purpose, as Jason (who is thankfully bearable) sets off to save his buds and lady bros after escaping imprisonment. Though he's supposed to be an average guy with no military experience, you wouldn't know it based on his ability to put down enemies with ease. The real interesting thing about his character, though, is his transformation from an inexperienced, sane dude to a psychotic killer who shouts out in excitement while stabbing pirates with a machete. Jason's transformation fits perfectly into the theme of insanity that envelops the story. That motif is hard to ignore, especially when loading screens are rife with quotes from Alice in Wonderland and some missions comprise pretty bizarre events. One will have you hunting mushrooms in an underwater cave while Jason is high out of his mind and hallucinating; another tasks you with setting fields of marijuana plants (and the pirates in said fields) ablaze with a flamethrower. Some missions even include extensive first-person platforming, which is surprisingly awesome. Leaping for long distance ledges will make your heart pound, especially thanks to the finely-tuned animations that lend a sense of weight and gravity to your slides and jumps. 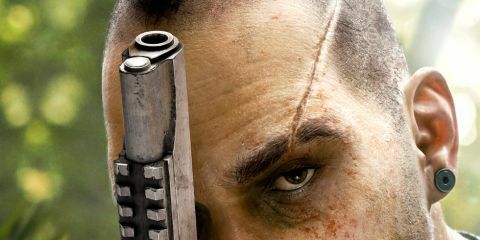 There are some truly memorable missions in store--the most terrific of which usually involve encounters with the mohawked madman Vaas--and the sheer variety of objectives means you won't always just be gunning down bad guys in a jungle. When you're not busy playing through the story missions, you'll undoubtedly get distracted by the bevy of great side content. The island is vast, and it's one of the prettiest virtual environments you've likely ever seen. It's also far more enjoyable to traverse compared to Far Cry 2's savannah setting, mostly thanks to less frequent run-ins with enemy patrols and more generous placement of fast travel points, which are unlocked as enemy-controlled outposts are liberated. There are radio towers to unscramble (which act sort of like synchronization points in Assassin's Creed), side quests to take on, leaderboard-driven challenge missions to complete, and tons of collectibles to find. Some of these feel out of place, though. Racing competitions and time-based "kill as many guys as you can with unlimited grenades" challenges don't exactly benefit immersion when you're supposed to be a guy stranded in a hostile jungle. But driving vehicles is so fun, and the combat so frantic and engaging, that you'll be hard-pressed to pass these opportunities up. Plus, all of these provide worthwhile rewards, usually in the form of cash for buying new weapons and equipment, or experience points for unlocking a variety of useful abilities, such as increased health or flashier takedown techniques. Rarely do side quest opportunities feel like filler content. Even hunting is worthwhile, as skinning animals affords the opportunity to manufacture additional weapon holsters or a bigger backpack for storing loot. The crafting here avoids the annoyances you might face in other open world games: There are no special crafting workbenches, as everything is done from within your inventory--and because the items you'll make are useful and don't often require a ton of materials, you'll never feel like you're wasting your time. Far Cry 3's multiplayer offering is where the experience comes up short. While some modes present fresh spins on traditional game types, the map design feels like an afterthought as most are variations of the same ruins-filled jungle. The competitive multiplayer is serviceable, albeit a bit on the buggy side, but it won't hold your attention for long when so many other shooters do multiplayer better. There's also a co-op mode that thrusts up to four players into uninspired objective-based missions, which are often unbalanced to favor enemy AI. The map editor is easily Far Cry 3's greatest multiplayer feature, though, and building custom maps to share with your friends might keep you playing for a while. The thing is, Far Cry 3 doesn't need a strong multiplayer component because its single-player campaign will keep you invested for dozens of hours. You'll be eager to explore every bit of the tropical setting, to drive along the beach or hang glide over the ocean. You'll want to find lost treasures in the sunken ships that line the island's periphery and stab sharks to death for their valuable skins. You'll be compelled to save Jason's friends--even if they're super annoying--because attempting to do so means experiencing some of the most interesting missions you've likely seen in a shooter. And when tigers, bears, or other distractions randomly interrupt those missions, you'll have some pretty awesome stories to tell. That's just how Far Cry 3 rolls. Single-player content reviewed on PS3, multiplayer on PC. Description Far Cry 3 throws players onto an island full of criminally insane monsters with machine guns led by Vaas, a new, psychopathic antagonist with a penchant for bloodshed.